The Tuscany Porto Corner Sofa Set is a wonderful addition to any outdoor area and is the perfect place to relax with friends, do some work or bask in the warm sun. 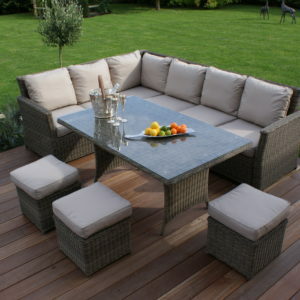 The natural weave has been hand woven onto a durable aluminium frame and uses weather proof rattan thus the furniture can be left outside all year round and will be protected against light showers. The sofa cushions are light beige in colour and are cosy and relaxing creating a very comfy sofa. 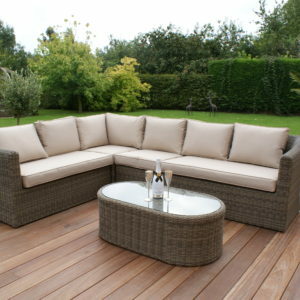 The Tuscany Porto Corner Sofa Set includes a small glass coffee table which is perfect for placing food and drinks upon.